To get this blog started on the right foot, I’m going to postpone some planned discussion and get right to the heart of the matter; analyzing potential stocks for investment. As I am interested primarily in dividend growth stocks in the U.S. and Canada, I thought I would start with one of the most well-known dividend growth stocks, Johnson & Johnson Inc. (JNJ). In addition to the above growth rates, a plot of historical earnings, free cash flow, and dividends paid is presented below. 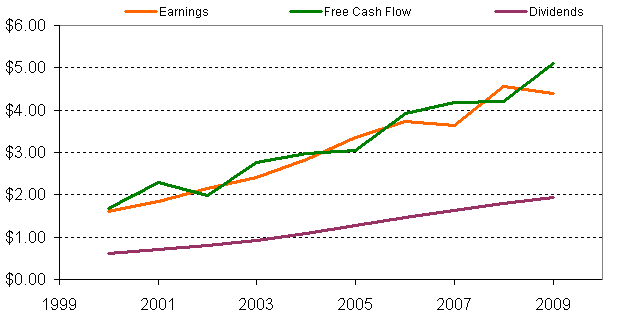 Note how earnings and free cash flow track each other closely and remain consistently above the dividends paid. Examining the 10-year growth rates, with the exception of tangible book value all other metrics grew at or above 10% year-over-year. Regarding the tangible asset growth, as a health care company, JNJ relies on intangible assets (patents and trademarks) to generate a significant amount of their revenue. Due to Johnson & Johnson’s strong brand recognition and product pipeline, I feel that valuing JNJ based on their total assets instead of tangible assets is appropriate. However, the risks in this approach are that any unforeseen impairment charges could adversely affect returns in the future. In determining these values, the lesser of 60% of the 10-year growth rate, or the 5-year growth predictions from JNJ’s ValueLine report have been used. Looking at JNJ’s return on equity (ROE) for the last 10 years (See Table 1 below), we can see that it has averaged 26.4% which is above the 20% average that I am looking for. In addition, the minimum ROE during this 10 year period was greater than 15%. By fulfilling both criteria, JNJ was awarded a star for the Good Business metric. To determine the relative attractiveness of JNJ’s dividends to the income from long corporate bonds, a Net Present Value (NPV) calculation of the difference between the two income streams has been completed. For this calculation, JNJ’s current yield of 3.4% was adopted along with the assumed dividend growth rate of 8.0% per year. The interest on comparable long corporate bonds was set to 5.2% per annum. Using this data, over a 20-year investing horizon the NPV of the dividend stream in excess of the interest on the long corporate bonds is calculated to be $650. As the income received from dividends is greater than the interest received from a comparable fixed income investment, JNJ is awarded a star for this income metric. As dividends are paid out of free cash flow, it is important to ensure that companies generate enough free cash flow to allow them to continue to pay their quarterly dividend while reinvesting in the business. Over the trailing 12 months (TTM), JNJ has generated $5.59 in free cash flow per share (fully diluted) while paying out $2.01 in common dividends. This results in a free cash flow payout ratio of 36% which indicates that the dividend is well covered. Examining the past 10 years, we can see that the free cash flow payout ratio has averaged 37.5% while remaining below 50% in all cases. Furthermore, as JNJ’s rate of earnings reinvestment is approximately 34% per year, this leaves a margin of 28% for additional dividend increases or share buyback programs in the future discounting the projected growth in free cash flow of 6.5% per year. The use of leverage (debt) by corporations can be a good way to increase their rate of return. However, taking on too much debt can be hazardous and can result in significant losses over time if not managed properly. As a measure of the leverage of the balance sheet, the debt-to-total capital ratio indicates the ratio between the debt and shareholder’s equity on the balance sheet. JNJ’s current debt to total-capital is 18% with a 10-year average of 15%. Both of these measures indicate a strong balance sheet. Corporations with highly leveraged balance sheets tend to have high return on equity due to the use of leverage. By examining the return on assets in addition to the debt to total-capital, an approximation of the return due to leverage can be ascertained. Over the past 10 years, JNJ has averaged a 15% return on assets which is very good. Based on the analysis of the free cash flow coverage and balance sheet leverage, JNJ is awarded a third star. Based on their Return on Equity over the last 10 years, a dividend payment that should outpace the interest income from corporate long bonds, and a well covered dividend payout and strong balance sheet, Johnson and Johnson has earned 3 out of 3 stars in the fundamental analysis metrics that I track. Tomorrow I will look at Johnson & Johnson’s valuation and examine some technical indicators for appropriate entry points. Full Disclosure: Long JNJ at the time of this writing. This entry was posted in Stock Screening. Bookmark the permalink.